Last Thursday, Rainer and Rait set a new world record for 1000K row. They completed the task in three days, seven hours, 23 minutes and 1 second. Beating the existing World Record by three hours! Rainer said "It is probably something that I will never forget. Since the start till the half, where we cheered when 500K was behind till the last 10K!" The boys had originally set out to beat two world record (the longest continual row too) but after 1000K they were too tired to row on. They aim to try the longest continual row record in the summer! Probably we are gonna do the longest continual in summer. Well done Rainer and Rait you should both feel very proud of yourselves. I know on behalf of the ETT team mates we are all very impressed. Hopefully when the summer comes around the sore backs and aching muscles will be a distant memory and you will be ready to erg again! 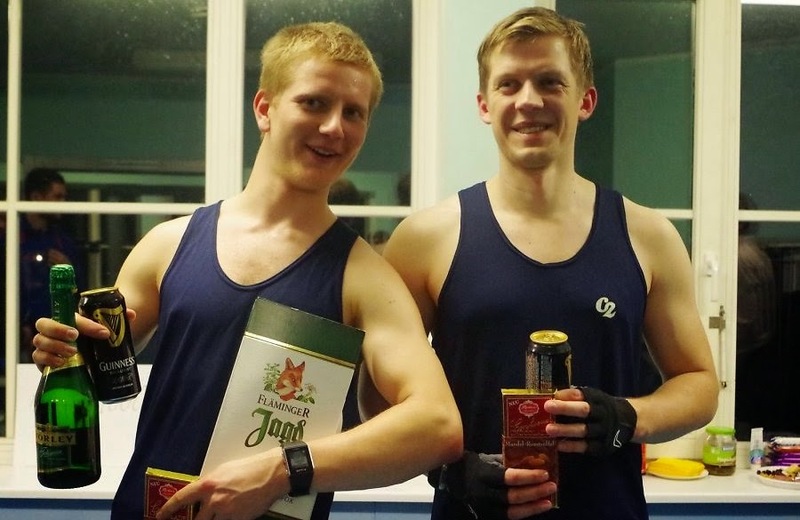 Rait and Rainer celebrate their amazing 1000k erging achievement with a few drinks! Back to the VTC, we are in 22nd place and have just been overtaken by Team Canada - those pesky Canadians! Keep up the good work team - we are nearing the half-way point of the challenge which is historically the most difficult bit especially if you are kick-starting some fresh routines and exercises. Keep strong and row hard! Don't forget to eat sensibly as I think the post Christmas mince pies and puddings may have worn off! What are you eating and drinking to fuel your rows? When is the best time of day for you to put in a good erg session?